Today we review a product that Go Formulas made called Keto Advantage. We intend to share all our findings of the product to educate consumers since we know that consumers prefer to know everything before they make a purchase. The consumer made the product to help you with weight loss, to increase your energy, to reduce hunger, to reduce cravings and improve digestion. The active ingredients can help you to lose weight, control your cravings, increase your energy and provide mental clarity. The inactive ingredients in the product are Natural Flavor, Citric Acid, Malic Acid, Beet Root Juice Powder and Silicon Dioxide. The manufacturer has not stipulated the detailed instructions for the dosage. The only information regarding the dosage we could retrieve is that each serving is 1 scoop. That is not sufficient to get the best results from the product. If we do not know all the details regarding dosage, we could also suffer side effects from the product. If you are pregnant, nursing or have a medical condition, you should speak to a health professional before you consume the product. You can purchase the product from the official website. The cost of the product is $99.95. The manufacturer has reduced the price. Consumers will incur an additional cost for shipping. The manufacturer has provided a money-back guarantee for the product. Any consumer who feels that the product did not deliver the results they expected can return the product to claim a refund. Consumers who take advantage of the guarantee will have to pay for the shipping cost to return the product to the warehouse. After analyzing the product from top to bottom, we can conclude on all aspects of the product. Our analysis showed us that the manufacturer made the product to help you with weight loss, to increase your energy, to reduce hunger, to reduce cravings and improve digestion. Our analysis also showed us several flaws in the product. We saw that the manufacturer had not provided detailed instructions for use for the product. Since we do not have that information, we cannot get the best results from the product, and it exposes us to side effects. We were also disappointed to see that the manufacturer had not included shipping costs in the product. The manufacturer had offered a guarantee; however, consumers will need to pay for the shipping costs if they want to get their money back. We searched for feedback from customers but came up empty-handed. That should serve as an indication to consumers that not many consumers have purchased the product. After considering all the aspects of the product, we can state that consumers are risking their money if they decide to purchase the product. A limited number of reviews states that consumers do not think highly of the product and have avoided it. There is no proof that the product works. Consumers will incur further costs when claiming a refund. 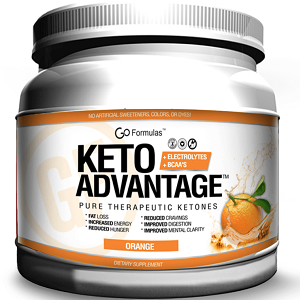 John Parker	reviewed Go Formulas Keto Advantage	on May 16th	 and gave it a rating of 3.